I think that is because I am going to be spending every single minute in our kitchen for the next three weeks cooking for our party. (Actually that’s not entirely correct. Next week we are filming a movie for six days so I won’t be able to do anything in my kitchen for six days.) And yes. It’s true. Today I am thrilled to be part of a blog hop with seven other bloggers. Be sure to follow the links to their posts which is at the bottom of this post! Special thanks to Janine from Happy Happy Nester and Ashley from ModernGlam Home for putting together this blog post. 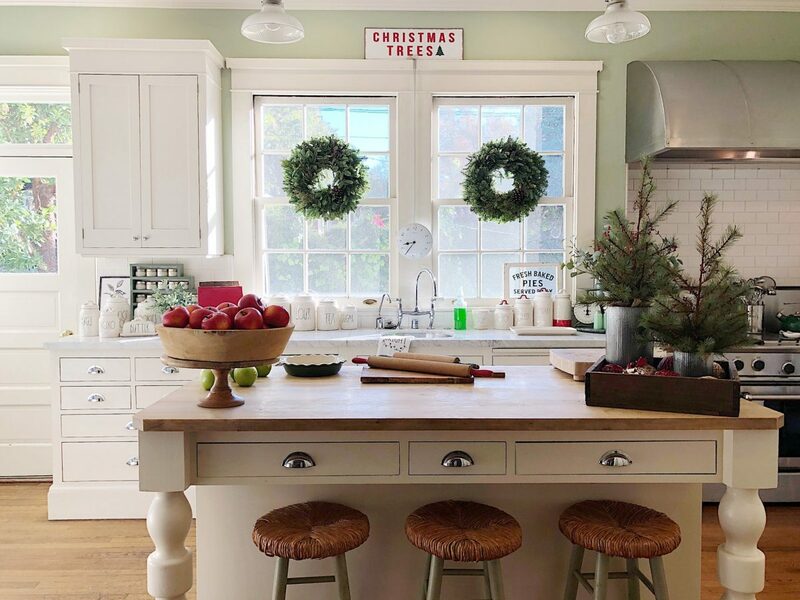 I am so excited to share with you my Christmas Kitchen Tour. So I had to keep the decor simple as I need every counter surface for pots and pans and cooking prep! I am cooking for 200ish and it’s a lot of food. Trust me! 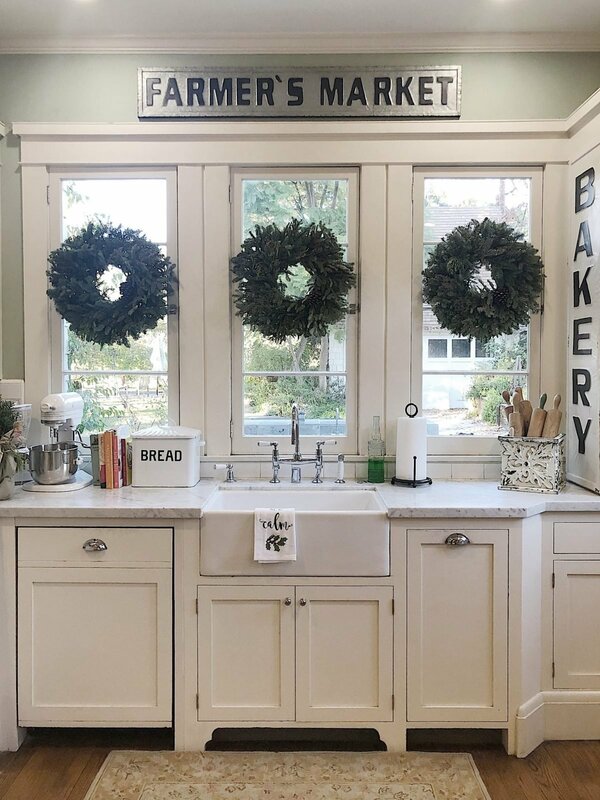 My favorite decoration I put in our kitchen are fresh wreaths on the windows. They smell so good! I went with a very traditional Christmas color palette this year. Red and white with a tiny bit of green. I know it’s not that creative but I am a traditional girl. And I love it. Next year I want to make Christmas floor cloths. Or I guess I could buy Christmas themed carpets for our kitchen. Either way, I think it would be festive. 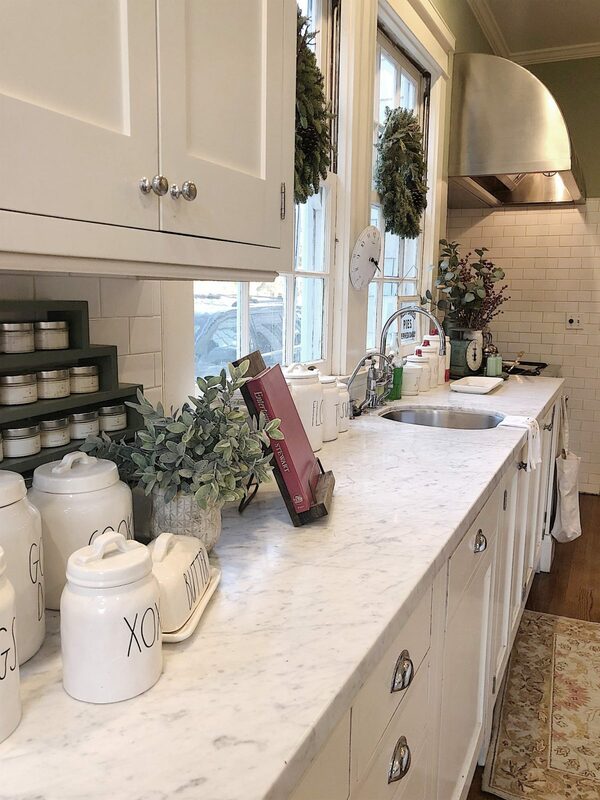 I do know that it is a lot easier to decorate a kitchen that is white with green walls. This paint color is my most frequently asked question. It is Farrow and Ball and the color is Cooking Apple Green. How awesome is this color? I love it. The wonderful sign on the counter is from my friend Kasey at Crafting in the Country. 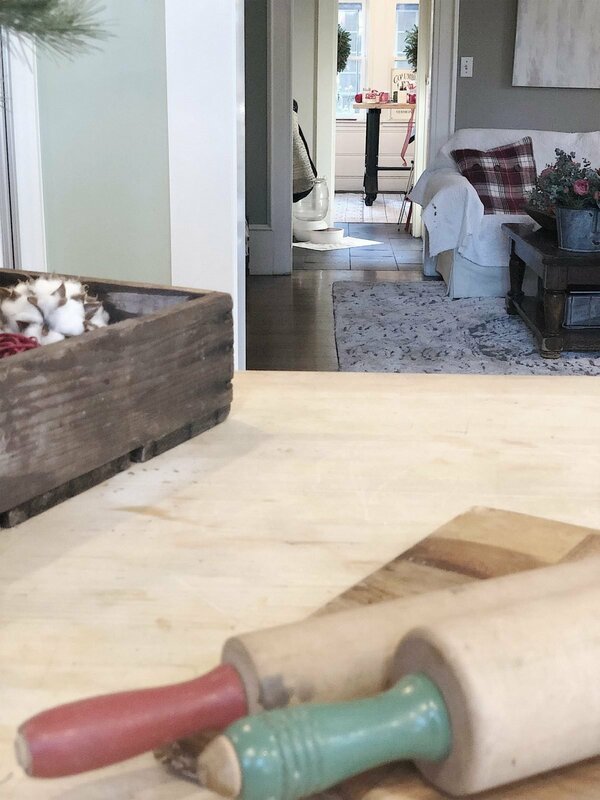 Do you recognize the cookbook in the holder on the counter? It’s my favorite all time book, Entertaining, by Martha Stewart. Who knew it was red underneath that gorgeous cover. The cookbook holder is part of my collection at Curtis Creation. There is something about this photo that I love. It starts in the kitchen, goes through the family room and then into my craft room. I love that! Just adjacent to our kitchen is our family room dining table. I love this area and it’s where we always gather fro breakfast. We dine here for almost every meal. Although occasionally we do make it in to the dining room for a nice meal. The kitchen is my heart and sole of our home. I love everything about it. And decorating the kitchen for the holidays makes sense. Thanks you for joining me for my Christmas Kitchen Tour. I really am in here from 8:00am to 11:00 pm for 7 days before the party. I simply cannot wait. It is going to be fun. 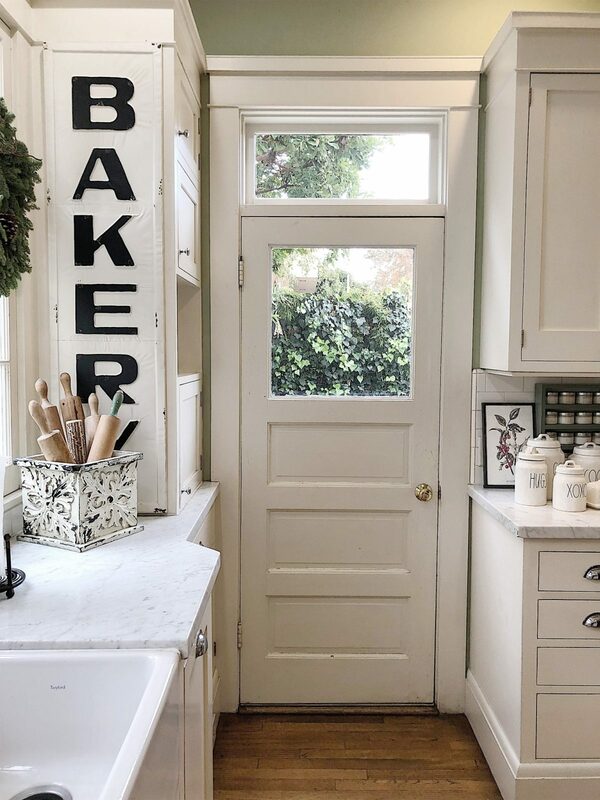 Be sure to follow these links and see the homes of some of my favorite bloggers. 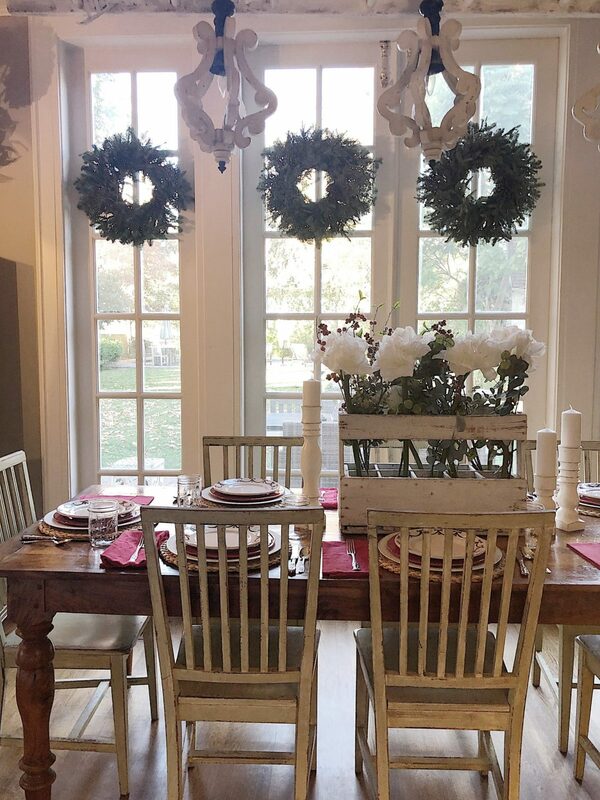 Leslie – love all the fresh wreaths in the windows! I would love to know how you hang the wreaths in your windows? Using what materials? Fishing line and tape or nails or hooks? This was just the inspo I needed to finsigh my kitchen!! Thank you friend! 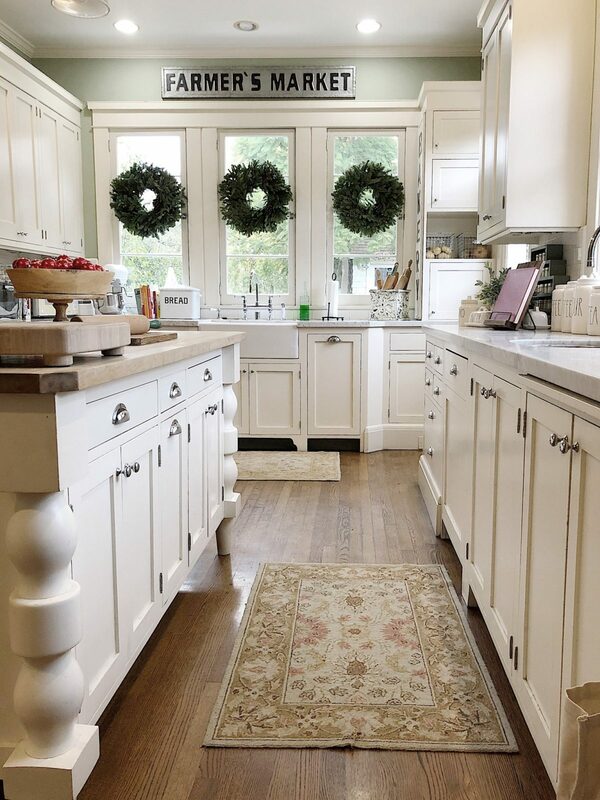 Leslie I love your traditional red and white with green in your beautiful kitchen! Those wreaths on the windows are gorgeous! I hope you and your family have a happy Christmas season! Leslie! Ive come to recognize your stunning kitchen. I am completely in love with it. All your special touches are so inviting. I would never leave that kitchen! Merry Christmas! 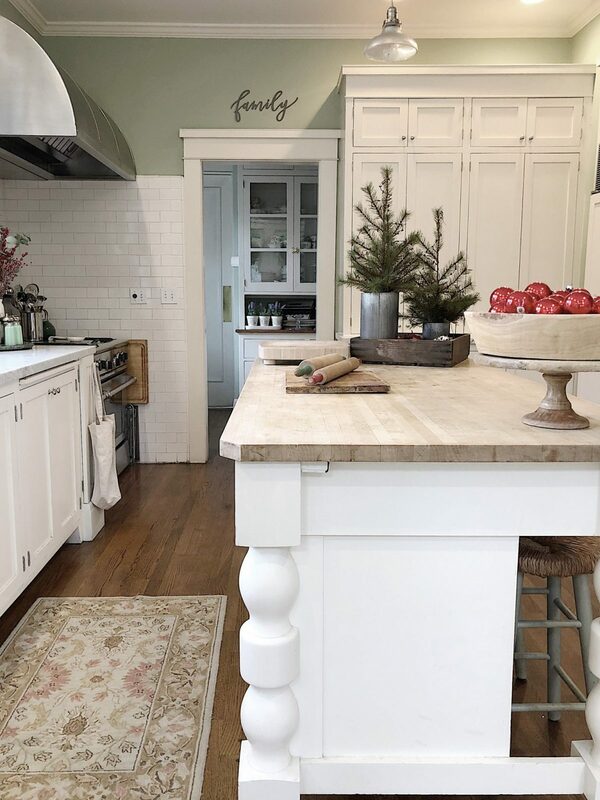 Your kitchen is so gorgeous! I always find your photos so beautiful and serene. I just want to pop into you kitchen and just chat and have a cup of coffee with you! Someday we will meet. Thanks for joining our holiday tour today. 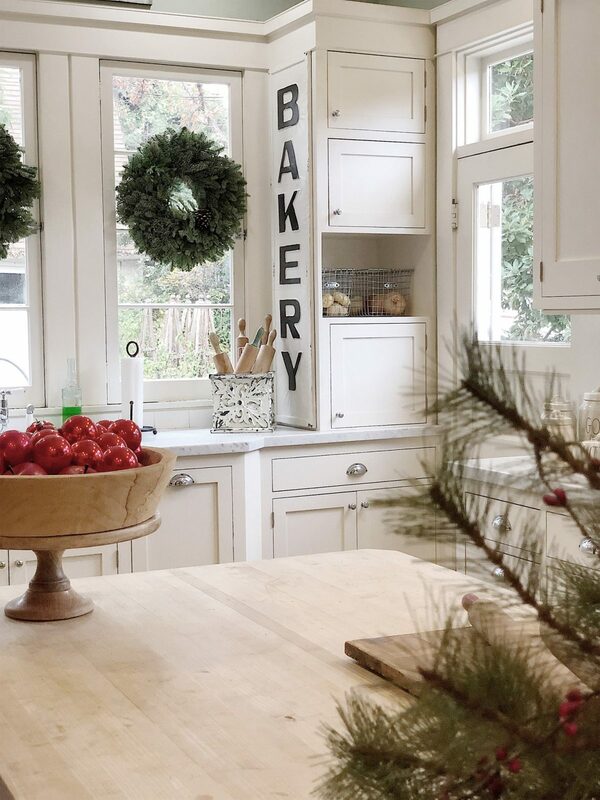 Your lovely home shows the simple elegance of Christmas! Lovely touches everywhere. I love your kitchen Leslie! The wreaths are just perfect! Thrilled to be on this blog hop with you ): Merry Christmas! You can feel that the heart of your home is the kitchen! I just want to sit in there and be surrounded by your wonderful scents. Blessings! It’s just beautiful my friend! Those fresh wreaths are beautiful. And cooking for 200!? My word. You are a holiday rockstar!